All soft centers, creamy and old fashioned. but distinctly flavorful. 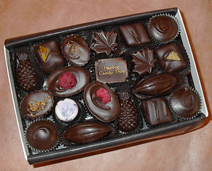 Raspberry and pineapple, blood orange, and black currant tea flavored crèmes begin this flavor array in dark vegan chocolates. Find Madagascar vanilla fillings and peanut butter along with raspberries and blueberries that we simmer into a concentrated jam center for a tart and sweet surprise buried inside creamy dark chocolate.